For many couples going through divorce, initiating the proceedings actually reduces a lot of the built-up negative feelings. For kids, however, initiating a divorce is just the beginning of a long, fraught battle. To begin with, always start by ensuring your children know you and their other parent love them, and that the divorce is not their fault. The work doesn’t stop there, however. If you are going through a divorce, try these six tips to help make the process a little easier for them. Divorce is often overwhelming and can bring up a lot of negative emotions. This is even more the case when kids don’t have any idea what’s happening. Explain clearly and simply that you and their other parent fight too much, aren’t happy together, and so on. Again, emphasize that your issues with the other parent are in no way their fault. Your children will likely experience varying degrees of sadness and anger as the divorce proceedings move forward and their lives change. Encourage your children to talk about their feelings and work with them to find ways to work through those feelings. Be sure to have emotional discussions often, as children are prone to bottling up when they think it may upset one or both parents. As the divorce moves forward, your children’s routines will change. Before big changes happen — like their other parent moving out or splitting up their week so both parents can share custody — be sure to tell your kids that the changes are coming. Generally, give as much notice as possible, and be sure to explain simply and clearly what is happening and why. Divorce often comes with arguments and fraught feelings. As much as possible, it’s important to keep those negative feelings away from your children. Avoid blaming or bad-mouthing their other parent, and if you do need to argue, be sure your kids aren’t around to hear. We suggest working with a family lawyer to help mediate any discussions you need to have with the other parent as a way of keeping arguments out of the children’s lives. Your kids will be feeling a lot of overwhelming emotions throughout the divorce proceedings, and those feelings may make them act out. Reacting strongly will make those feelings worse. Don’t encourage negative behaviors, but do take the time to help your child work through what he or she is struggling with. Acknowledge the underlying feelings and provide better outlets where you can. It isn’t always possible, but cutting down the duration of divorce proceedings can also help your children cope. In order to smooth the process as much as possible, it’s important to find an experienced family lawyer to guide you through the steps. In addition, as we mentioned above, a family lawyer can help mediate disputes and keep arguments away from your children. 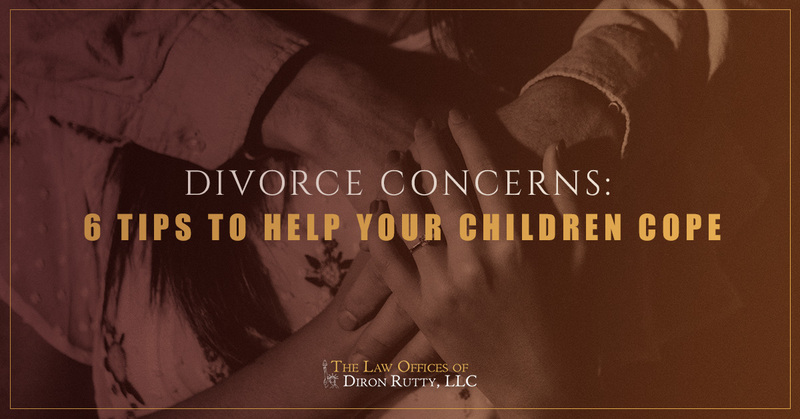 For family law questions and more in the Bronx, contact the Law Offices of Diron Rutty to schedule a consultation.